Hospital and dialysis facility disruptions caused by Hurricane Sandy led to increased emergency department visits, hospitalizations, and a slight rise in the death rate of kidney patients in New York and New Jersey, according to a new study published in the January issue of the National Kidney Foundation's American Journal of Kidney Diseases. The study was conducted by researchers from the U.S. Department of Health and Human Services’ Office of the Assistant Secretary for Preparedness and Response (ASPR) and the Centers for Medicare and Medicaid Services (CMS). 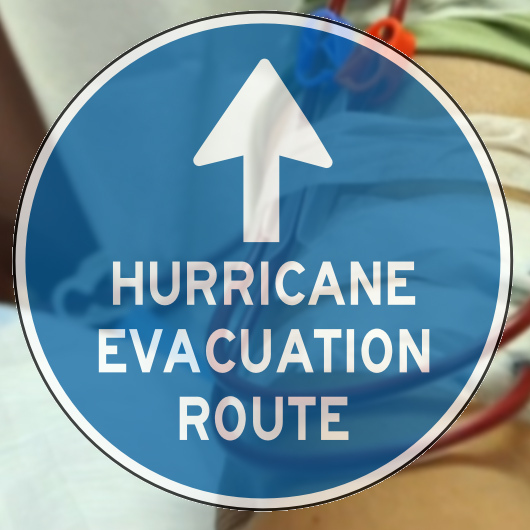 The study serves as a stark reminder that patients and health care facilities need to have emergency plans for receipt of dialysis, well in advance of natural disasters. “The research showed clearly that delaying dialysis can have devastating health effects for patients with end stage renal disease,” explained Nicole Lurie, M.D., co-author and HHS assistant secretary for preparedness and response. The study analyzed CMS data from 13,264 patients living in the areas hardest hit by Hurricane Sandy in New Jersey and New York. These data were compared with those on patients in states unaffected by Sandy during the same time period, and to those on patients living in the Sandy-affected region a year prior to the hurricane. Researchers found that emergency visits for patients in the impacted areas went up to 4.1 percent – a higher rate than the 2.6 percent and 1.7 percent found in two comparison groups. In-patient hospitalization rates were also higher. Approximately 23 percent of patients who had an emergency department visit during the storm also received dialysis treatment there. In addition, there was a small increase in mortality for end stage renal disease patients in Sandy-affected areas versus those in the comparison groups. In the 30 days following Hurricane Sandy, death rates rose to 1.83 percent compared to 1.47 percent and 1.6 percent in comparison groups. The study documented that a large number of patients received pre-emergency dialysis care. Almost 70 percent of the dialysis facilities located in the study areas provided early dialysis to 59 percent of dialysis patients on the Sunday before the storm struck. Early treatment on this scale was attributed to the strong relationships that had been developed before the storm, enabling close collaboration and coordination among state and local health officials, kidney networks, Kidney Community Emergency Response Coalition (KCERC), and dialysis patients prior to, during, and after Sandy. The study also highlighted the need for patients and providers to have redundant ways to communicate and an understanding of what protective measures to implement prior to, during, and after a disaster. For example, in advance of an emergency, patients, providers and facilities should discuss emergency renal diet options and supplies to have on hand as well as their facility’s protocol for obtaining early dialysis. Dialysis patients should regularly update their facility and nephrologist on their emergency plan, including an updated caregiver contact list. Patients should request information from their facility on how to access care at an alternative facility if theirs closes. Patients should have multiple transportation options ready to get to and from their treatments. All patients should have a copy of their current dialysis treatment plan, hepatitis status, and list of medications to bring with them should they need emergency dialysis. Facilities should also ensure their patients understand who to contact if their facility is unreachable by phone or Internet. The information should at a minimum include contact information for their regional kidney network and the Kidney Community Emergency Response (KCER) Coalition’s patient hotline, which is available at: www.kcercoalition.com. Approximately 450,000 Americans are on dialysis and approximately 185,000 live with a functioning kidney transplant. In 2011, more than 92,000 patients died from causes related to kidney failure. There are approximately 5,938 dialysis facilities and 251 certified kidney transplant facilities in the U.S. Of these dialysis facilities, approximately 765 are hospital based.